Installers of solar energy systems are trying to unload megawatts worth of panels cheaply after buying too many at high prices earlier this year. Call it irrational exuberance or greed. Companies that couldn't get enough solar panels to build power plants in Spain earlier this year are now trying to sell megawatts worth of panels at a deep discount. Installers of solar energy systems that have purchased an estimated 1.7 gigawatts worth of panels this year were able to use only 800 megawatts of the goods before the Spanish government shrank a lucrative solar incentives program in September, said Paula Mints, principal solar analyst at Navigant Consulting at the Thin Film Solar Summit in San Francisco Tuesday. As a result, some of these installers – Mints wouldn't offer any names – are selling the crystalline silicon panels at around $3 per watt. When the same buyers gobbled up panels earlier this year, they also drove up the prices to as high as $4.50 per watt in Spain. In 2007, the average panel price was $3.50 per watt, Mints said. The high price seemed justified when the more lucrative incentives were in place. Without less attractive ones in effect now, those expensive panels make for an expensive solar power plant. Meanwhile, prices for new panels are falling. "Spain is a bit of a mess," Mints said. "Where are those panels going to go in this economic downturn? We are in a precarious situation." It all started last year, really, when Spain implemented a program requiring utilities to buy all of the solar power generated in the country at prices set by the government. Those prices were higher than the prices for conventional power. It was a good idea, a model that had turned Germany into the world's largest solar market. But the rules for the Spanish program were different than the German program. And that was where the trouble began. Spain said the incentives would apply to the first 400 megawatts worth of power projects. The government thought the country wouldn't see that many solar panels soaking up the sun and feeding the grid until 2010. It was wrong. The total installations reached 344 megawatts by September of 2007 (see Is Spain Shining Too Brightly). So the government froze the program while it was figuring out what to do. That meant the lucrative solar electricity rates were still in effect but the incentives for the first 400-megawatts were not in force. After many negotiations and handwringing, the government finally settled on new rules for the program and put them into effect in September. 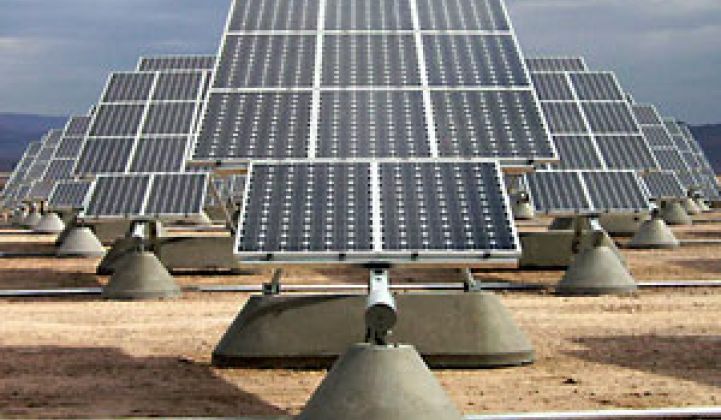 The new program put a 2009 cap at 500 megawatts and cut the solar electricity rates by as much as 29 percent, depending on whether the solar panels are installed on the rooftops or the ground. (see Solar Approves 500MW for Solar). Solar companies see the 500-megawatt cap as a drastic measure to control the market, considering some analysts believe the country could install more than 1 gigawatt of new solar energy systems in 2008. Mints said the number is more likely to be less than 1 gigawatt. In comparison, Germany's feed-in tariff program doesn't have an annual installation cap. Instead, it would reduce the electricity rates by a greater percentage for the following year when installations exceed a certain capacity in the current year. The reduction would be smaller if the installations fall under the limit. The goal of any feed-in tariff program is to lower the rates over time until solar energy costs roughly the same as conventional power. The assumption is the cost of setting up solar power plants will decline over time as the market grows and more equipment makers participate and compete against one another. Mints compared what has happened in Spain to the U.S. housing market, where a boom caused prices to soar and blindsided homebuyers and bankers into thinking that the good times would last a lot longer than it did. "The panels were sold under the optimism that this [new feed-in tariff] could not happen," Mints said. "If you are inside the market, it's your job to be optimistic."